The Portland Public School board is scheduled to vote March 8th on a program that would allow military recruitment, under the guise of science education, of PPS kids in grades K-5. The program (STARBASE) has been in Portland schools since 1993. PPS receives just over $300,000 per year for providing access to the kids. STARBASE and the district’s claim that there’s a need for this particular program or that it’s an effective way to teach science is weak at best. to establish ongoing collaborative partnerships with higher education, business/industry, policy makers, and other key stakeholders in support for exemplary, research-based teaching and learning in science, mathematics, and technology within the context of a large and diverse urban district. In science, NSF schools made a gain of 6% in 5th grade, 6% gain in 8th, and 9% gain in 10th grade, compared to district growth of 4%, 4%, and 9%. Minority students improved in science in the NSF schools faster than whites. The percentage of 5th grade African American students who met standards increased from 36% from 47%, compared to whites that increased from 79% to 81%. Hispanic students have traditionally not performed well in math and science. This year, many of them improved particularly in science. In NSF schools, the number of Hispanic students who met standards increased from 37% in 5th grade to 46%, from 25% to 34% in 8th, and from 20% to 27% in 10th. In our view, the Portland USP can readily claim success with developing greater teacher leadership capacity for math and science education improvement in their district. Their theory of action – of how to achieve increased capacity – was sound. First they focused on creating change “from the bottom up,” instead of from the top down. The USP also sought to make lasting changes to teachers’ beliefs, recognizing that ultimately the individual is the unit of change. Changes that reside within the individual teacher, that is – their ways of thinking and teaching and learning vis-à-vis math and science education – are, therefore, lasting legacies. Schools come and go, and staffs and principals and reform foci also shift frequently in large urban districts. Given that reality, seeking to create changes from the bottom up, and individual-to-individual, are strategies that promise a greater likelihood of sustainability. Also when robust vision, commitment and skills reside locally at the school level, the work of improvement in math and science is more likely to continue in spite of district change. Finally it is important to point out that teacher leadership capacity does not disappear. It is a renewable resource, a districtwide (though often invisible) asset that can be harnessed and directed for worthy purposes. The development of indigenous teacher leadership is, therefore a wise, ecological model for improvement. Inverness Research Associates’ final report indicates that the program was a big success. The conclusion is too lengthy for a blog but these are the highlights. Given the relatively small scale of the USP investment, roughly $20 per student per year, it has reaped enormous benefits, leaving behind a host of tangible and intangible assets in the district. To name the most significant of these assets are: a well-honed, highly respected and very experienced leadership team for math and science; a district-wide group of teachers and teacher leaders committed to math and science improvement; a cadre of classroom teachers with vastly improved skills and knowledge in math and science teaching, as well as skills and knowledge about how to work together to provide and continuously improve high quality programs for students; systems and structures organized to deliver and maintain curricular materials; a strategically designed, well-crafted professional development program; a clearly articulated and commonly held vision for high quality math and science education which lends coherence to efforts for improvement at multiple levels of the system; and finally, the accumulated good will and success of the USP effort which enables people to continue to work hard and with optimism toward their shared goals even in difficult circumstances. So given PPS own data and reports and an evaluation conducted by an outside organization, the NSF program was effectively closing the achievement gap in math and science and PPS could have easily sustained the effort for $20 per year per student. Why is PPS now offering up the very same groups of kids supported by the NSF grant to the military for a mere $300,000 in a weak, non-sustainable so-called science program? Have they dismantled the infrastructure that was so effective for poor and minority children? It just makes my point in the previous post that PPS is unwilling to close the gap. The bottom line is that PPS poor kids are the district’s contribution to the war efforts. Demographic information readily available from the district does not provide a fine-grained detail of fourth- and fifth-grade students targeted by the military’s STARBASE recruiting program, but it is clear that poor and minority students are over-represented. Of the 18 schools participating this year, all but four are Title 1 schools. All but three have higher percentages of minority students than the district-wide minority enrollment (46%). All but four have higher poverty than the district at large (45%). 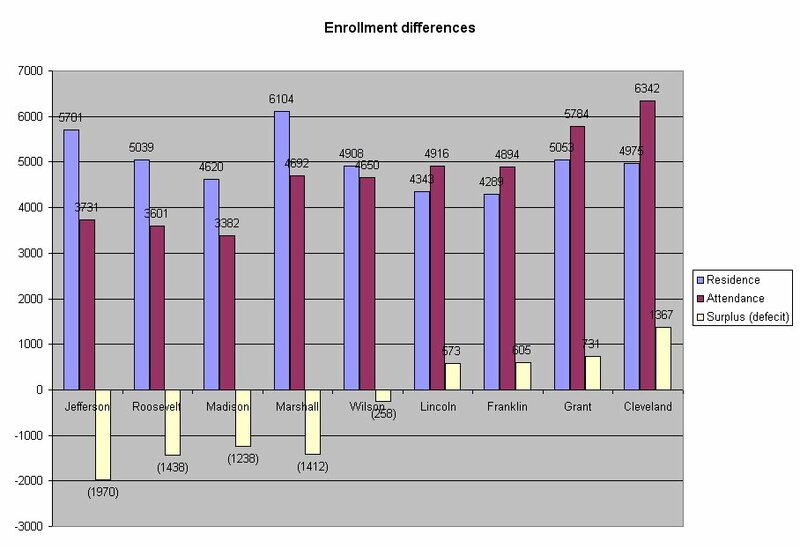 The schools participating average 11 percentage points more minority and 17 percentage points more poor than the district as a whole, even when factoring in the four wealthy schools that participate. While many participating staff and families may swear there is no recruiting going on, the program is funded from the US Department of Defense recruiting budget. The military is clear about their need to target potential recruits early. Student information is shared with the military with little or no notice to parents (or opt-out opportunities), and the program is explicit in its goals of improving the image of the military with young children. Here are the schools participating this year, with their demographic information. School board member Bobbie Regan may be signaling opposition to proposed limits to neighborhood-to-neighborhood student transfers, according to a report by Beth Slovic on Willamette Week‘s news blog. Regan’s apparent expression of unease with the proposal, which is part of a larger redesign of the high school system, comes on the heals of an Oregonian editorial Monday which expressed more direct opposition to the idea of limiting the flow of students and funding. 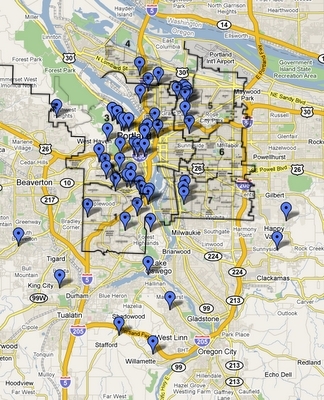 Each year, thousands of students and tens of millions of dollars in education funding transfer from Portland’s poorest neighborhoods and into its wealthiest. Schools in the Lincoln cluster home to Regan and the wealthiest familes in Portland Public Schools, had a net gain of nearly 600 students in 2008-09, representing over $3 million in funding. In that same school year, schools in the Jefferson cluster, encompassing some of Portland’s poorest families, lost nearly 2,000 students and about $12 million to out transfers. A school’s achievement index shows how well it succeeds at teaching reading and math, on a scale from 0 to 133. A school gets 133 points for every student who exceeds the grade-level standard in reading or math, 100 points for students who meet the standard and 100 points for students who begin far below grade level and reach an ambitious growth target. Here is a summary of the correlation (not causation) between the new index scores, percent of students qualifying for free and reduced lunches, and percentage of ELL students (via PASW, formerly known as SPSS). 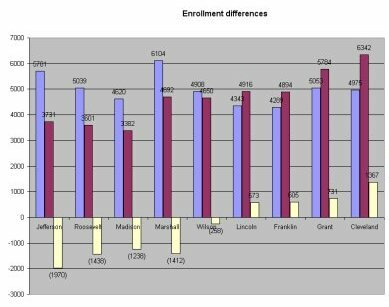 These data tables and graphs looked only at the 56 traditional elementary schools and K-8 schools. No, I’m not a statistician – but there’s an awfully strong correlation between the variables. Kenneth Libby is an independent education researcher and a recent graduate of Lewis and Clark's Graduate School of Education and Counseling. He writes about national education issues, testing and philanthropy on Schools Matter and Global Ideologies in Education. Who Funded Pam Knowles’ Election? This article is reprinted with permission. It originally appeared on the author’s blog Global Ideologies in Education –Ed. The election process has turned into a media campaign complete with campaign managers, corporate donations, media budgets, and the presentation of false statistics (more on this later; let’s just say Knowles either has no idea what she is talking about or is knowingly misleading the public). The map above shows the sources of 57 donations to Knowles’ campaign. Several of them are in her district, but the vast majority aren’t even on her side of the river. All of this information is available here through OreStar, Oregon’s election reporting website. These 57 donations account for around $15,000 of Knowles’ $34,030 campaign; the other donations were less than $100 apiece and do not require documentation. I have no doubt that Knowles had the support of some people in her district — some of those sub-$100 donations were from voters in her district — but she certainly pulled in her biggest chunks of funding from the West side (and Portland businesses). What is Knowles saying that makes the business sphere take note? First, Knowles claims we have a 42% dropout rate. She pushes for “stabilizing funding” for the schools without calling for taxes on businesses (she’s also the COO of the Portland Business Alliance; do you think they like the new tax hikes?). She practically screams efficiency and accountability in the voters’ pamphlet — all while suggesting the K-8 model is here to stay because “research” says it’s better. Added insult: part of that “research” is an overt attack on teachers (they’re more “accountable” in the K-8 model). Question for Pam: why do we have the K-8 model only in one part of town while another part of town (the wealthier side) gets a 6th grade academy and then a 7/8 grade school for middle school? 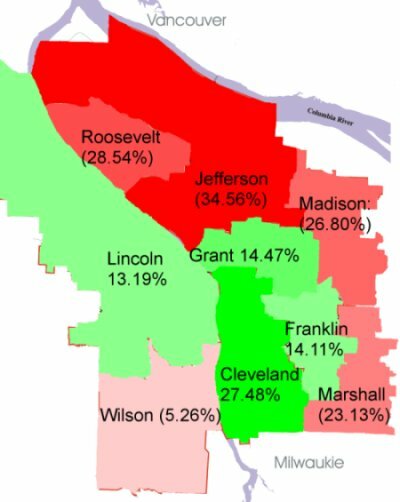 The claim of a 42% dropout rate isn’t unique to Pam; the Mayor has made the same claim as well (although I informed the Mayor’s office of their error and it sounds like Sam understands the issue). I’ll elaborate on the dropout statistic soon — but I can tell you that Knowles is intentionally misleading the public or completely misinterpreted educational studies (or she never bothered to read them).